It’s 2014! And we’re proud to say we ended 2013 with a BANG! In November and December alone, we welcomed seventy five new members. Let’s do the “year in review” just to see our progress thus far to help set goals for 2014. Beginning January 2013, we hosted our monthly Classroom and In-Water Training sessions that were (and still are) open to all Guam residents. We have over 300 bright, enthusiastic members spanning from the age of 7 to over 60 with the shared interest of Guam’s coral reefs. It’s been a great experience watching how our members have grown in their own way and share their experiences of Guam’s waters with one another. My absolute favorite is to see “amazement” on the faces of our members when they see a new marine animal, a beautiful coral or understand a new aspect of marine ecology. 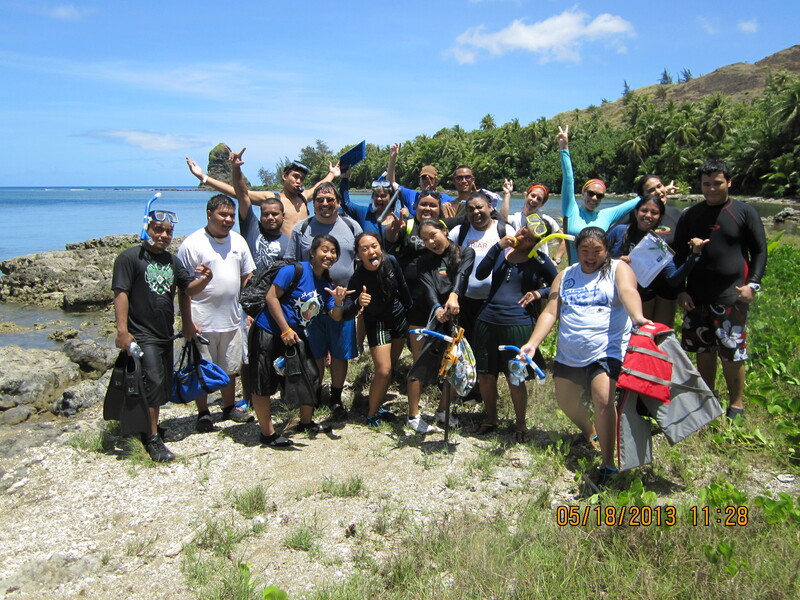 In 2013, we also started training student groups from University of Guam (UOG): UOG Green Army of the Center for Island Sustainability and UOG Americorps. Both of these groups have assisted with our data collection in primarily Fouha Bay as part of the Humatak Project. They always bring tons of energy (and laughter) to monitoring events. Additionally, we started training the Conservation Corp from War in the Pacific National Historic Parks summer program. Next month, Conservation Corps will begin collecting data through monitoring surveys at their adopted site, Asan Beach Memorial Park. We’ve also been working with the Umatac Coral Reef Ambassadors to set up their adopted sites of Umatac Bay and Cetti Bay, which they began monitoring in September 2013. 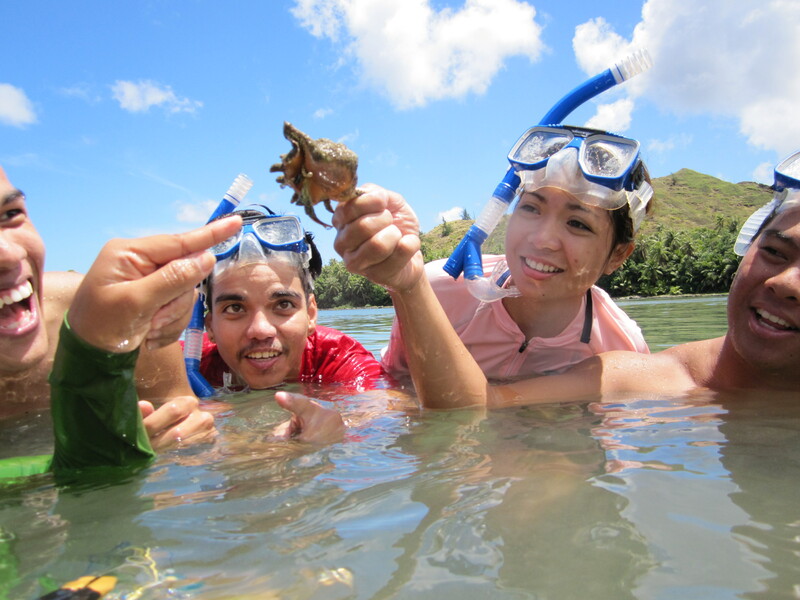 Other groups we’ve worked with are Americorps members of Pa’a Taotaotano cultural group, Guam Community College marine biology students, and George Washington High School’s proactive Marine Mania group. If you have a group or organization that is interested in adopting a monitoring site, please contact us. Toward the end of 2013, we partnered with National Park Service to host Science Sunday. So far, we’ve had an awesome turn out since it started in October last year. Every third Sunday of the month, different local scientists have an opportunity to share their work on Guam’s coral reefs or in Micronesia with the community. Last year, the community heard talks on coral bleaching and disease, Marine Preserve Areas in Guam and Micronesia, and a new project on Guam looking at coral reproduction. 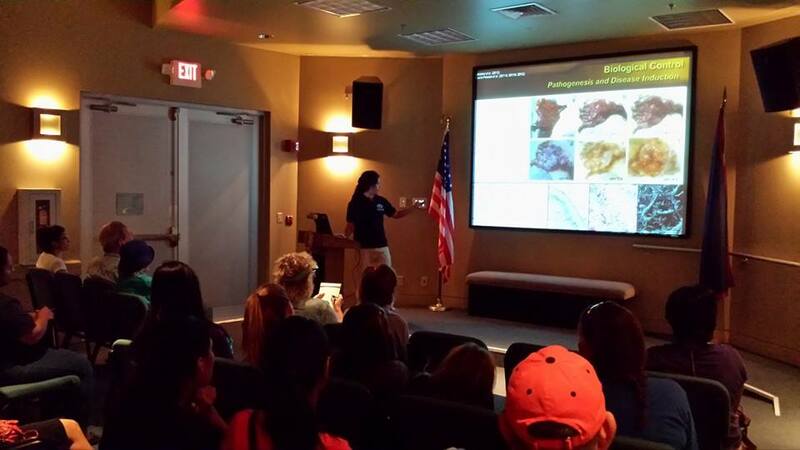 We kicked off 2014 with an awesome Science Sunday featuring the infamous Crown-of-Thorns Starfish. Science Sunday has provided a place for the public to share their observations and experiences on Guam and ask some very important questions about threats to our coral reefs. Shout out to all our guest speakers of Science Sunday: Roxanna Miller, Dr. Pete Houk, Mike McCue, and Ciemon Caballes! 2013 was a great year! We gained really enthusiastic and bright members, worked with groups who want to monitor a bay that’s important to their community, and opened communication lines with scientists and the public. Needless to say, we have some high standards for 2014. Thank you to our program members, partners, and all those that have supported (and continue to support) our efforts to engage Guam residents as stewards of the island’s precious coral reefs.